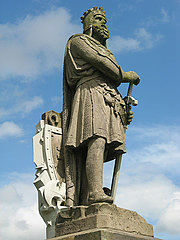 The dream held for so long by William Wallace was eventually realised by Robert the Bruce. Strange, considering they had completely different objectives to start with. The Bruce was born into nobility in 1274, a distant relative of the Scottish Royal Family. In the 1290s his grandfather laid claim to the throne along with John Balliol and others. The new King would be decided by arbitration, and the arbitrator, who was King Edward I of England, chose John Balliol. Robert and his father lent no support to Balliol and when Edward invaded Scotland in 1296, to force Balliol to abdicate, so Edward could rule Scotland as a province of England, Robert and his father gave support to Edward. With the thought that he would one day rule Scotland, and fired by his own personal ambition, it is no surprise that Bruce lent his support to the side that was most likely to fulfil his objective. 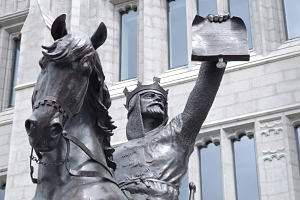 For example, he also supported William Wallace in the struggle for an independent Scotland, and after Wallace was defeated at Falkirk in 1298, Robert the Bruce was given joint guardianship of Scotland along with John Comyn. He and Comyn never seen eye to eye, and during a quarrel in a church in Dumfries in 1306, Bruce stabbed and killed Comyn, paving the way for him to be ruler of Scotland, and he was unofficially crowned at Scone. This was seen as an act of sacrilege and he was excommunicated by the Pope, who did not back Scotland being independent. Many patriots rallied to join Bruce in the fight against Edward, but in reality, most of their time was spent avoiding capture. In five battles against the English, Bruce lost every one, and he was forced to flee the country. Bruce took refuge in a cave off the coast of Ireland and spent the winter there. Legend has it that he watched a spider trying to weave a web across the roof of the cave, and it failed. The spider had four more attempts which also resulted in failure. Bruce was thinking “five times the spider has failed, and that’s how many battles I’ve lost. If the spider tries again I will try once again to free scotland.” The spider took a rest, and tried again. This time it succeeded, and Bruce returned home, inspired. 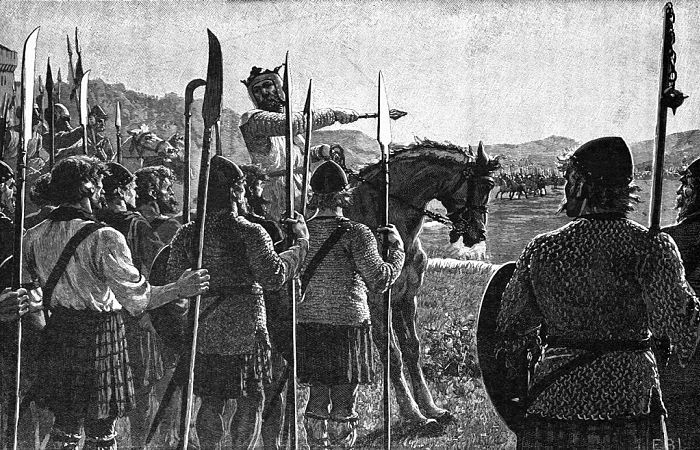 On his return he had a few successful guerrilla campaigns including recapturing Perth in 1313, but his finest hour was about to come the following year, 1314, at the now famous battle of Bannockburn. Although heavily outnumbered, he defeated Edward II of England’s 100,000 strong army, with his own army of just 30,000 men. When Edward III ascended to the Throne of England, Bruce’s army harassed the English so much that Edward was forced to acknowledge Scotland’s freedom. In 1324 the Vatican finally recognised Bruce as the King of Scotland, and the Treaty of Edinburgh-Northampton, recognising Scotland as an independent Kingdom, was signed in 1328. Now reconciled by the Pope and with the country at peace with England, Robert the Bruce had realised his dream, and he died on 7th June 1329 at the age of fifty five. The cause of his death is thought to be leprosy, but this has been disputed. Robert the Bruce was buried in Dunfermline Abbey, but his heart lies in an unopened leaden casket in Melrose Abbey, which he was instrumental in rebuilding. To this day He is rightly remembered as one of Scotland’s greatest heroes.